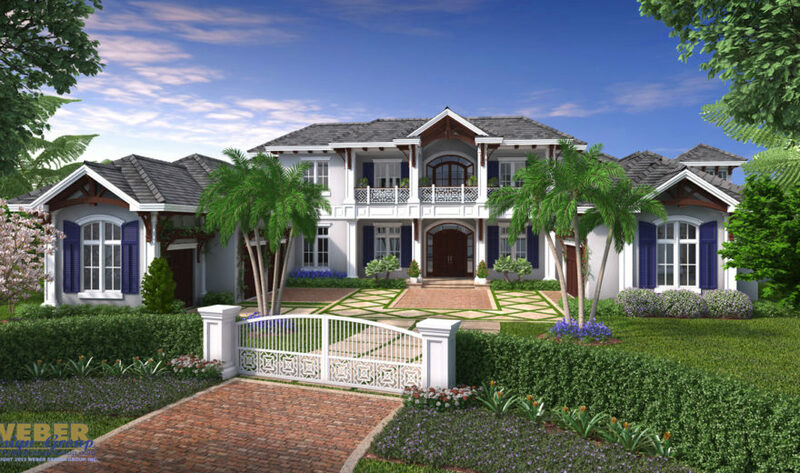 5 Mansion House Plans Perfect for Pampering Mom - Weber Design Group; Naples, FL. 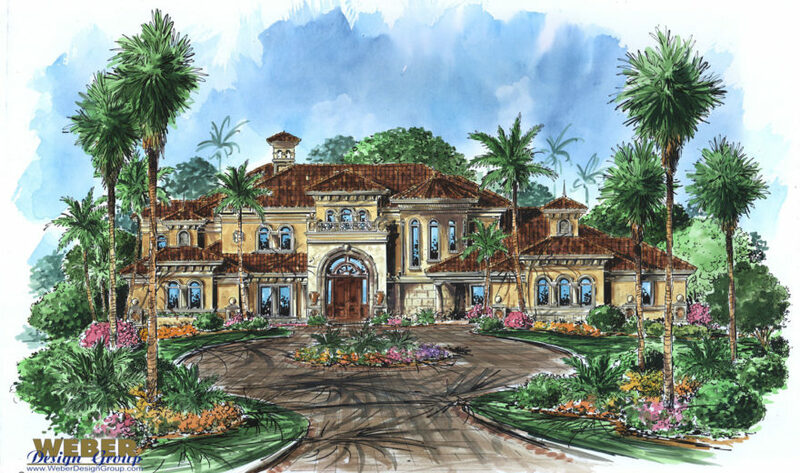 The harmonic convergence of spaciousness, elegance, comfort and magnificent Mediterranean architectural details create what Villagio Toscana house plan was intended for – an exclusive estate life on a grand scale. To the delight of its residents, this luxury home plan design’s intention is heralded upon approach and particularly at the point of entry where a magnificent rotunda foyer and sweeping staircase give way to entertainment central – living room, dining room with built-in buffet, gourmet kitchen and family room. Residents of this mansion will find daily sanctuary in an incomparable master wing with a large sitting room. View details about this mansion house plan. 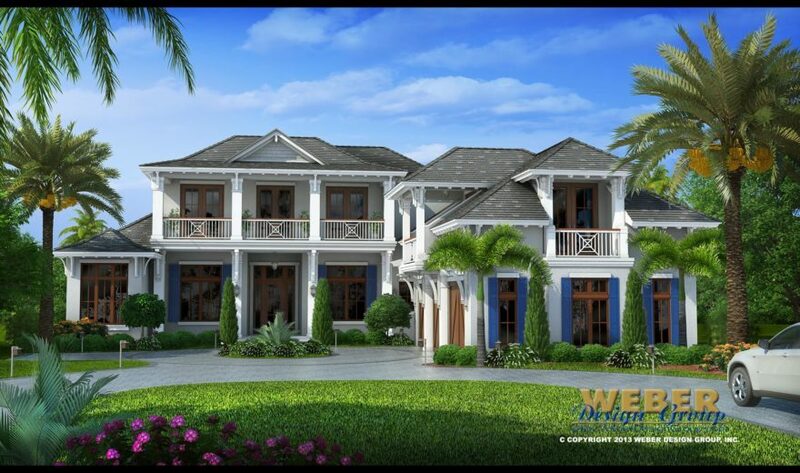 This luxury West Indies House Plan has a family room layout with five bedrooms, six full baths and two half baths, a formal dining and living room, beautiful built-in wet bar, spacious upstairs loft area, an elevator and even a separate maid’s suite complete with a private entrance. Outside amenities of the island-inspired tropical home plan include an outdoor kitchen, a fire pit with lounge area and over 1,500 square feet of outdoor living space. This mansion house plan leaves no architectural detail to be desired with every room having their own intricate ceiling design and an abundance of windows and glass sliders for enjoying any view oriented waterfront lot. View details about this mansion house plan. The Coral Crest House Plan is a magnificent two-story dream home with a beautiful stately curb appeal that functionally caters to what modern families want in a luxury home. The plan features two master suites, separate caretakers quarters, three additional bedrooms and five full baths at just under 8,900 square feet of living area. This unique house plan was designed to take full advantage of waterfront, beach and coastal view-oriented lots. The interiors incorporate a tremendous amount of glass from floor to ceiling to provide a seamless vista out across a reflection pond that spills into a large resort style infinity pool. View details about this mansion house plan. 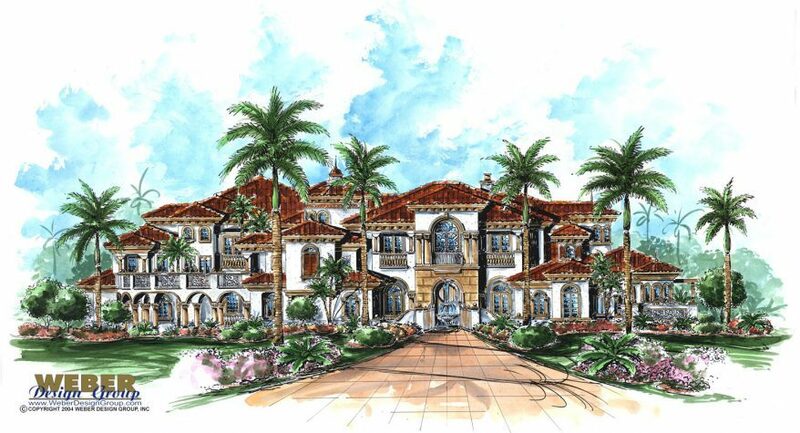 The award-winning Vasari house plan is a luxury Mediterranean design that was designed for a special lot with a spectacular waterfront, golf course or coastal view. This spacious Tuscan house plan has many rooms for entertaining plus places for peace and tranquility. Many amenities can be found in this beautiful design including a theatre room, parlor, outside covered lanais-both upstairs and down, swimming pool, bonus room, exercise room, and so much more. View details about this mansion house plan. 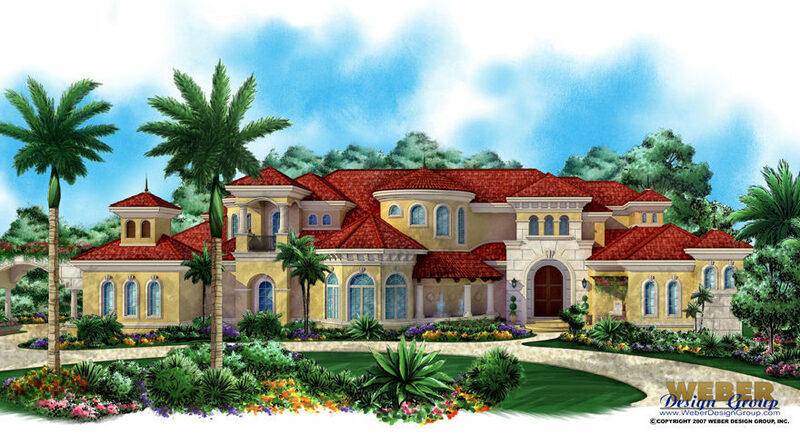 The Bellagio is the ultimate dream home plan capturing unsurpassed warmth and beauty with its beautiful Italian architecture in a colorful setting of lush, landscaping and water features. This massive six-bedroom estate has over 10,000 square feet of the most exquisite interior finishes and is a total of 18,000 square feet spread over a large estate setting. From inside this mansion, not a single waterfront view is missed as the result of careful planning of rooms and the use of large expansive glass windows and doors. View details about this mansion house plan.